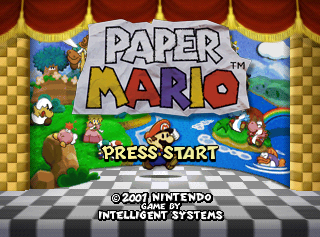 Paper Mario is the second RPG starring Nintendo's mustachioed mascot, and the first in the successful Paper Mario series. Please add the unused / interesting text from the Notes page to the main article or a subpage. The amount of unused enemy formations is just ridiculous. Two unused tracks can be found in the game's soundtrack, which seem to be early versions of the intro/title themes. The segment at 0:50 is the same in the final intro theme, accompanying Bowser's appearance. The second track would be for the title screen following it. Interestingly enough, the beginning of the first track was reworked into the song played in the ending scene after Bowser's Castle is destroyed. The intro song is actually split into two parts. The first part plays until 1:07 before being replaced by the second part, but the actual song is 1:27 long. Some songs in the game have unused variations. Details on the Notes page. It's a sped up and shorter version of the normal song. Begins as a sped up version of the normal song, it returns to normal tempo when the "Chanterelle's Song" segment starts. A sprite of Princess Peach kissing someone (likely Mario, if the rest of the franchise is any indication). Her palette suggests the scene would take place during the first part of the ending when Peach's Castle is descending to the earth. Badge and map icons from an earlier version of the pause menu. Mario's head in profile. Appears right before the smaller Mario head used on the stats menu, so it is likely just a larger version of it. "Super" and "Ultra" prefixes, which go untranslated in the international versions. Some early battle icons. The blue bag was used for the partners menu at one point. Charge icon for Goombario, as well as a generic version. While a corresponding jump/hammer icon shows up whenever Mario uses Jump/Smash Charge, Goombario never gets one. A battle counter reading ○かいめ ("X-th time") that goes up to 3. What this was for is unknown, and it too goes untranslated. The numeral font closely resembles one used for the main HUD in early screenshots. An earlier version of the star that appears at the end of dialogue boxes. This one is in the same graphical style as the character sprites, with no shading and a thick outline. An earlier version of Chuck Quizmo's audience. This one is static and divided into left and right halves, while the used audience members are full-body sprites that move individually. Action Command prompts for the Control Stick moving up and down. 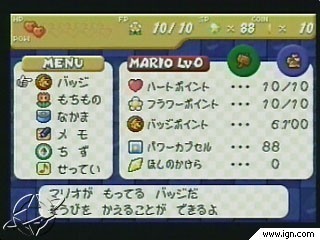 No moves require you to tilt the stick vertically, but there is unused text in the Japanese version for a cut Action Command that involved rotating it Mario Party-style, which these graphics may have been part of. Close to the sprite for the Super Block disc is a variant with a "U" insignia. Text exists in the Japanese version for a scrapped "Ultra Block" object (which was replaced with the Ultra Stone), which this almost certainly would have been used for. In Shiver City, this model shows a broken "fully cracked" frozen lake that is supposed to be the 3rd model of the frozen lake while Mario ground pounds. Developers changed it so this layer doesn't show as Mario gets kicked out of the area and the lake resets after the second ground pound. This can be done by using a glitch, however. Fun with palette swapping. You can see the working enemies in action here. This is an Albino Dino. A blue Fuzzy. All that's been found is the enemy name and blue palette. This is a D. Paratroopa. This is not the sub-boss with the same name. There are two different entries for Red Goomba in the enemy name table. This is a Red Goomba with wings. Yep. Red Paragoombas originally appeared in Super Mario Bros. 3, which this game draws a number of elements from. Interestingly, Whacka has an entry in the enemy name table and a tattle! Based on the tattle, it seems that earlier in development, instead of disappearing after being hit enough times, he would attack. his head looks like a donut hole. Specifically: Look into Goompa as a possible party member since Goompa can actually stick to your party throughout the whole game through the use of glitches. 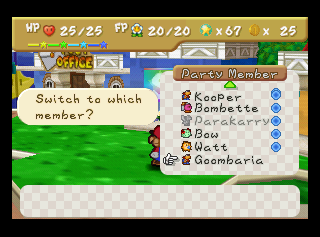 You can add Goombaria as a party member by using the GameShark code 8010F2F4 0001. She'll appear at the end of the party member list (by pressing C-Right) after all others, but with Kooper's icon. She'll follow Mario around on the overworld like normal party members, but she has no special ability. She'll also show up on the Change Member menu inside a battle, however she doesn't appear to have anything programmed for battles and thus will crash the game. If she is the currently active party member, pressing C-Right to bring up the party member menu will crash the game. There are several test areas in the game which can be accessed with GameShark code D10740B0 0000 810740B0 ??? ?, where "????" is the room's ID number. This works best when using the exit from Goomba Village's main room to the room where Mario is found in the Prologue. Be aware that other exits are also affected by the code, and that your progress in the game can cause freezes depending on where you end up. The colored circles added to each of the renders here are to show scale. 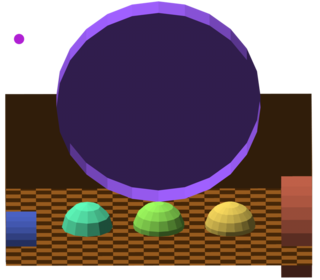 Each circle has the same size relative to the game models. Each of these rooms have no background music. 0: The right entrance of the first path from Goomba Village to Toad Town. 1: The left entrance of the part in Dry Dry Desert with a Stopwatch item in it. Given that its room ID falls in the middle of the Toad Town rooms and that it leads to the chapters of the game, it is likely that this room was used during much of the game's development. 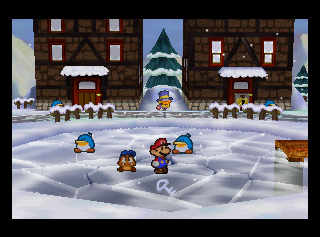 In the center of the room is the name "MARIO RPG" spelled out in separate polygons, from when the game was still Super Mario RPG 2. Above the logo is Goompa and five Mushrooms. Beyond that are a few dummy switches for testing purposes. The small treasure chest up in the corner is empty, while the bigger chest next to it contains the Super Hammer, but freezes before any sound is played or text is shown. By the large switch is Misstar, who flies away when Mario gets too close. 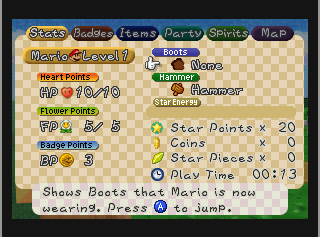 Talking to the Koopa NPC sets Mario's max HP to 8 and gives him the Normal Hammer. Talking to Kolorado does the same, but sets the max HP to 11 instead. An NPC Star Rod sits in front of the Prologue exit, talking to him, Mario will hear NPC Star Rod say absolutely nothing and remains in a few seconds. In front of the NPC Star Rod is a hidden block. A blocky room containing item blocks. The yellow block that requires the Ultra Boots and the red block both contain a Flower. The block on the floor is empty. The path on the left leads to Room FFE0, right in front of the Chapter 7 exit, while the path on the right leads to Room 0176. 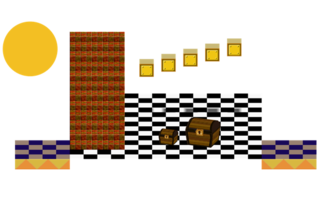 The room sports Super Mario 64 textures and has no background. A room containing a staircase, already-hit blocks, and a couple of empty treasure chests. The path on the left leads to Room 0175, while the path on the right leads to Room 0177. Like the previous room, it has no background. A large room containing a variety of objects. 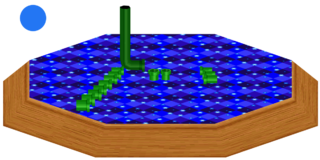 Mario is able to walk around in the "water" area, with only an invisible wall that blocks off the small lowered ledge from the water. The blocks in the second area all function properly, with the exception of the POW Block and the Super Block. Hitting the POW block does nothing, and hitting the Super Block crashes the game. The stacked boxes both contain a mushroom, and the single box has nothing in it. Touching either the spikes or lava crashes the game after Mario rockets skyward. The path on the left leads to Room 0176, while the path on the right leads to Room 0178. The ground has an unused blocky texture. 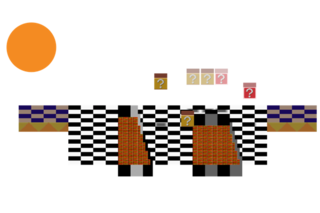 A room containing some rotating platforms and Goompa. Mario is also mirrored along the middle of the area, but not like the mirroring in Crystal Palace. The path on the left leads back to Room 0177, while the path on the right leads nowhere. Entering this room will crash most emulators, except when entering through the Debug Hub. Pressing START will also crash. A forest room with only a handful of features. Four colored arrows point around the path on the floor. 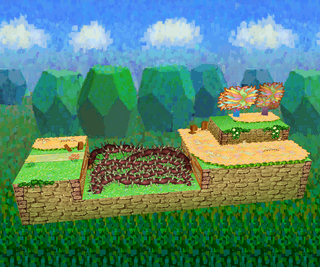 The camera will move around with Mario when he moves near an area that is between paths, or moves onto a path. 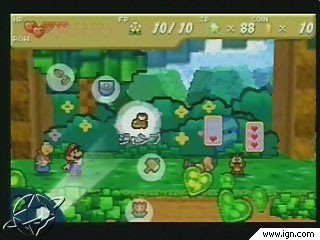 Next to the Heart Block in the center is a standard hidden Star Piece panel; collecting the Star Piece resets Mario's HP to 10 and FP to 5. All paths lead to the opposite end of the same room. It uses the background from Toad Town. A room that looks like an early version of a hallway of Crystal Palace. The far wall mirrors Mario twice, with one reflection being locked to the plane of the mirror, the other following the depth of his movement. The mirror itself is not solid and can be passed through. 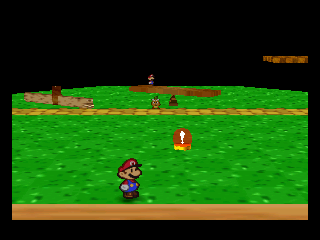 Most of the textures are unused, including a reflection image of Mario stuck on the floor. There are mirrored polygons under the room, but the floor is not transparent and thus they cannot be seen. Specifically: Accessing this room softlocks the game for some reason. 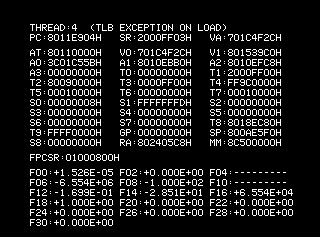 It doesn't crash it however, the music continues playing and the crash handler isn't triggered. A room sporting a Flower Fields-like design. While it crashes in-game, it can be viewed within a map editor. A room containing a line of Koopas. Talking to them changes them into a partner character, with three copies of Lakilester. In the center is a ground panel that gives out a Heart each time, but it can only be flipped with a super stomp. 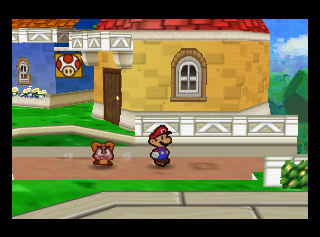 A strange ripply distortion effect follows Mario around as he moves. Compared to the sides of the ground, the camera is facing the wrong way. There are no boundaries on the sides of the room, leaving Mario to fall and re-spawn at the edge when the player walks off it. The room uses Toad Town's background. A room containing a collection of pipes, none of which work. The floor sports an unused texture similar to the one used for Shooting Star Summit. A mysterious room containing a variety of objects. 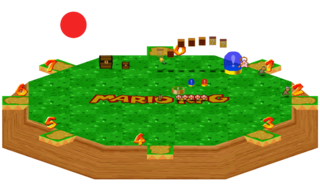 It is extremely large compared to Mario and normal rooms, with Mario taking up less than a third of the width of a single square on the floor. It's actually part of the Toad Town Playground rooms, right after Smash Attack (mgm_02). 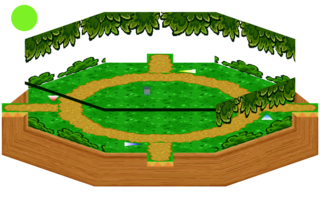 Interestingly, this is the only unused room where Goombario can tattle, although his tattle is the same as for the Jump Attack game. This message has the distinction of being the very first message in the ROM, making it, most likely, a test. Filler messages that take up a ton of description slots. An interesting message that appears four times in the ROM. This is used as Quake Jump's description. It also appears after the 3rd sign message in the Windy Mill well. It's possible there was a fourth room leading to the boss fight, but was deemed unnecessary. 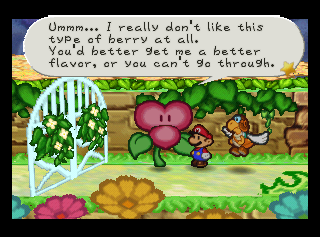 type of berry at all. flavor, or you can't go through. Supposed to be spoken by the Red Flower Gate Guard in Flower Fields if he were given a Yellow or Blue Berry. They're impossible to obtain before going through his gate, making this unused. You can still see it by hacking either berry into the inventory. 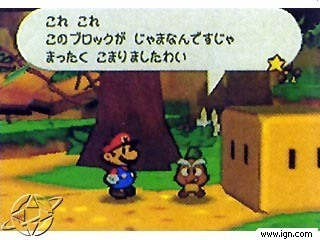 In the Japanese version, characters in the south area of Toad Town will each give a unique message if they're spoken to earlier than intended. It is possible to see these messages by abusing out-of-bounds glitches to bypass the collapsed logs blocking the area. Tell me if you see it. You shouldn't be able to get here yet. If you did, it's a bug, so please get in contact. If it does, it's a bug. So if it does, tell me right away. In the international versions of the game, these messages were deleted entirely, and speaking to NPCs in these versions will softlock the game. These dates are in plaintext, unlike most in-game text. This plaintext date is the same in all versions of the game. It doesn't prevent Mario from jumping in the overworld, but it does keep him from using it to get First Strikes, and the command is disabled in battle (saying there's nothing to jump on, even when that isn't the case). Paper Mario has a crash handler similar to other N64 games by Nintendo (such as The Legend of Zelda: Ocarina of Time). It can be accessed by triggering a fatal exception through exploiting one of the game's various glitches or through tilting the cartridge. Strangely, it only appears in the North American version, and does not seem to be present in the Japanese version. A few seconds after the game crashes, the exception handler prints register information for the System Control Processor (top lines), the main CPU (middle line), and the Floating-Point Unit (bottom lines). In the Smash Attack mini-game, one of two mini-games found in the Playroom, ten(!) Luigi sprites are loaded underneath the room. Paper Mario stores all of a room's actors out-of-bounds when not in use; however, Luigi is never seen in this room. The fact that there is not just one, but ten Luigi sprites loaded in the room heavily implies that Luigi would have originally popped out of a block instead of a picture of Peach. This page was last modified on 11 October 2018, at 07:00.